Have you ever actually wondered Why we reincarnate? Why is it that we have such short lives, and, for the most part, the only spiritual paths are very dubious religions and teachers? Or why those religions are built upon hierarchal structures? Have you ever wondered why there is so much evil in the world? And why such evil people seem to become the leaders of men? And the big question concerning reincarnation: Why don’t we remember our past lives? How can we resolve our past if we don’t even remember it? We go through our lives with our past lives haunting us, yet we cannot see them. We carry the residual habits and traits from our former selves, yet we have no idea where they came from. For the most part, we don’t have any idea how they are affecting us now. Therefor, how can we ever resolve our past issues? Especially since they affect us even in this life? So what caused this fall? We can see that at one point, gods from the sky came, and humans were taught about agriculture and animal husbandry, which is the enslavement of animals. With that knowledge came the cities, the kings, the hierarchal systems of control, armies, war, slavery and the worship and sacrifices of gods. This was the fall of man. Mankind fell out of balance and harmony with Mother Nature and thus began losing virtue. So who were these gods that came and gave humankind this knowledge? From where did they come? They are not of the Earth. They came to enslave humankind, to demand flesh and blood sacrifices, including human sacrifices. They demanded to be worshiped. And, as we read in the old testament, Jehovah would destroy entire races, or have his “chosen people” destroy them for him. The Gnostics called these gods the archons. Don Juan called them the predators. These gods have been feeding off of humanity for thousands of years. They consider us their herd, just as we consider farm animals. As above, so below. They feed off of our negative emotions and energies and they feed off of our worship to them. They especially like blood and suffering, so they create conflict, violence and wars between men. Notice most wars were between religions. But they also control us through religions, ideologies, governments, societies, propaganda, the media, etc. Another way of controlling us is through reincarnation. Reincarnation is a form of slavery. After the fall, man’s duration of life was drastically shortened. Before the present age, men only lived a short average life span of 25 to 40 years. That is not enough time to figure out what life is about, especially if all they were given were the religions of the gods. They had to toil all day, raise their families and then they died. And then comes the question of why we don’t remember our past lives. We are constantly born into ignorance and the only knowledge available was what the gods gave us – religions and ideologies. After a few short years, we die in ignorance and then return again. This keeps the herd in order. Without any remembrance, we are imprisoned in ignorance, without the proper tools to break free. Occasionally a few great souls were able to liberate themselves, but the priests took control of their teachings. They skewed them and butchered them into religions. We find ourselves in a matrix, where an artificial light construct has been overlaid upon the real world. As in the movie, The Matrix, we are simply batteries that the gods feed off of. This is our plight, where we are born and we die in a matrix as food for evil entities. And of course they have their minions here on Earth that keep the herd in line. So the next question is: What happens when we die? When we die, we enter the cosmic matrix, another false light construct which we call heaven. Our souls are trapped within this prison of the gods. After some time in the false heavens, we return again in the same cycle. 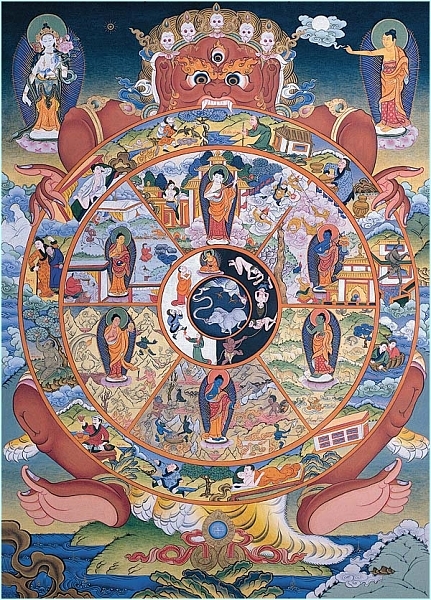 This is called the wheel of samsara, the cycle of birth and death. See the matrix for what it is. It seems all powerful, without any way of escape, But it is full of holes. If you have an open mind, discernment and the eyes to see, this whole game is nothing more than a house of cards. In Ask Simple Questions I showed many examples of how this entire matrix is falling apart at the seams. The question is, will you wake up, or be dragged away in the net, to continue on the wheel of birth and death? Imagine how fortunate you are to come into contact with the keys to escape this prison. You can see how confusing it can be with all of the religions, new age philosophies, false teachers and teachings. I see that there are a few great masters who shine above all of this confusion. Take what you can from them, but blaze your own trail into your inner Self. Break free of the prison. « Soul-Catching Net: Are We “Recycled” At Death To Remain In The Matrix?